Nathan for You season 3, reviewed. In its third season, Nathan for You is even more delightfully deranged—and ingenious. 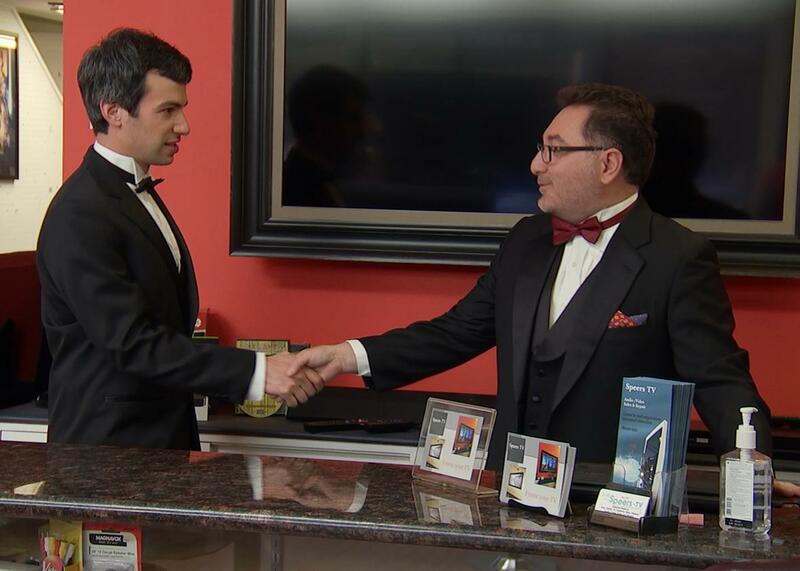 Nathan Fielder institutes a black-tie dress code as part of a complicated plot to help out an electronics store on Nathan for You. Nathan for You, Comedy Central’s brilliant, fascinating, and uncomfortable interrogation of manners, capitalism, and the manners of capitalism, returned for its third season Thursday night. In it, as he has so many times before, the unassuming Nathan Fielder attempted to help a struggling small business with a scheme both logical and ridiculous. Methodically following through on this plan, Nathan took careful step after careful step, until he and the business had calmly and willfully wandered into a realm of total lunacy, like a frog hopping from lily pad to lily pad until he arrives in an upside-down world where the sky is purple, the water is yellow, and lily pads are pizzas. As ever, Nathan, an awkward guy in an oxford, doggedly attempts to obey the rules, invariably demonstrating just how absurd and broken those rules are. Here are some classic Nathan for You setups. Fifty percent of people believe in ghosts, so Nathan suggests that a realtor capitalize on this market by promising ghost-free homes. Nathan helps a gas station by creating an impossible-to-claim rebate. Nathan pitches a taxi service that is getting walloped by Uber on providing free rides for pregnant women. A struggling frozen-yogurt stand tries to make a splash by selling poo-flavored froyo. Nathan builds a Starbucks knockoff (the infamous “Dumb Starbucks”) to capitalize on the coffee giant’s brand name. In last night’s premiere, Nathan set out to help an electronics store owner who is getting undercut by Best Buy, by planning to sell TVs for $1 and forcing Best Buy to match that price. Nathan, whose on-camera persona is as earnest as it is weird, is very serious about his schemes. He sets out to dot every i and cross every t, even if those i’s are a part of “I want to make a viral video to help a petting zoo,” and the t’s part of a nondisclosure agreement informing the video staff that, should they talk about said viral video, they will be subject to the “death penalty.” To keep anyone from buying the $1 TVs at the electronics store, Nathan hilariously institutes a strict black-tie dress code, puts the TV behind a 2-foot-tall door, and positions an alligator between the door and the televisions. Even the most ardent deal seekers—and if Nathan for You teaches us anything, it’s that there will always be ardent deal seekers—do not want a dollar TV more than they want to avoid a run-in with an alligator. Last night’s episode kicked into high gear when Best Buy wouldn’t match the $1 price. Nathan, who knew that the $1 price was bogus—the electronics store was desperately trying not to sell TVs at that amount, hence the alligator—gets outraged. Like everyone else, Nathan forgives himself for being wrong but can’t forgive being wronged. “‘How could Best Buy, one of my favorite companies, turn their backs on the very promise that drew me in as a customer?” he wondered. “I’m so tired of big companies like Best Buy and Enron thinking the rules don’t apply to them,” he said, before investigating whether he can get the rules not to apply to him as well. Nathan decides to sue. But to protect the electronics-store owner from a counterclaim, he wants to prove the owner is insane. (Nathan looks up the “insanity defense” on Wikipedia. Nathan is always looking things up on Wikipedia, a joke about the shallowness of Nathan’s expertise.) He takes the owner to a therapist, gets the owner to tell the story of the alligator, and voilà: The therapist thinks he is divorced from reality. Meanwhile, Nathan’s lawyer tells him he needs a whistleblower, so Nathan stages a dating show with Best Buy employees, looking for a source. He finds one, but the evidence is inadmissible. To top it off, Nathan finds the people he sent to buy the dollar TVs from Best Buy and tries to prepare them for a court appearance, where they can’t admit Nathan sent them to Best Buy. “Do you recognize this man?” he asks a woman, holding up a picture of himself. After all this, Nathan determines that a lawsuit that involves nearly a dozen people placidly putting up with Nathan’s zany litigiousness won’t fly. He realizes he can’t sue and that he’s lost sight of his priorities. This is a regular move of Nathan for You: ending, like so many reality shows, on a note of hope and lessons learned. The difference is that Nathan for You knows it’s smuggling razor blades inside the kind words and decent manners.